The race is on to see which will freeze first: the northeastern offshoot of Lake Huron, Georgian Bay, or Lake Erie. 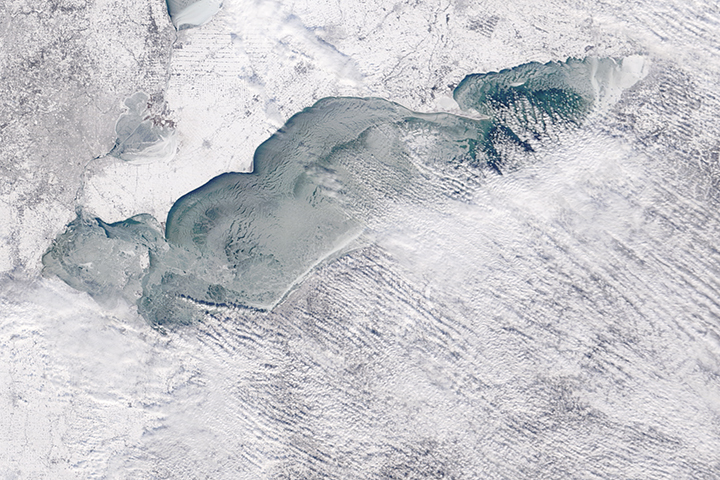 These images of the five Great Lakes—(left to right) Superior, Michigan, Huron, Erie, and Ontario—show ice beginning to build up around the shores of each of the lakes, with snow on the ground across virtually the entire scene. Both images are made from observations from the Moderate Resolution Imaging Spectroradiometer (MODIS) on NASA's Terra satellite on January 27, 2005. 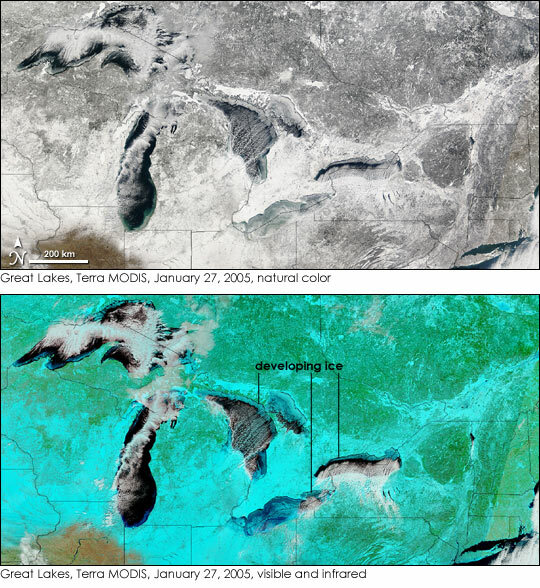 The top image uses MODIS observations that simulate a digital photograph, while the bottom image adds infrared observations that help sort out all the "white". Snow and ice become electric blue, while clouds remain white. Open water appears blue or nearly black, and vegetation is bright green. Both Georgian Bay and Lake Erie have a considerable amount of ice. 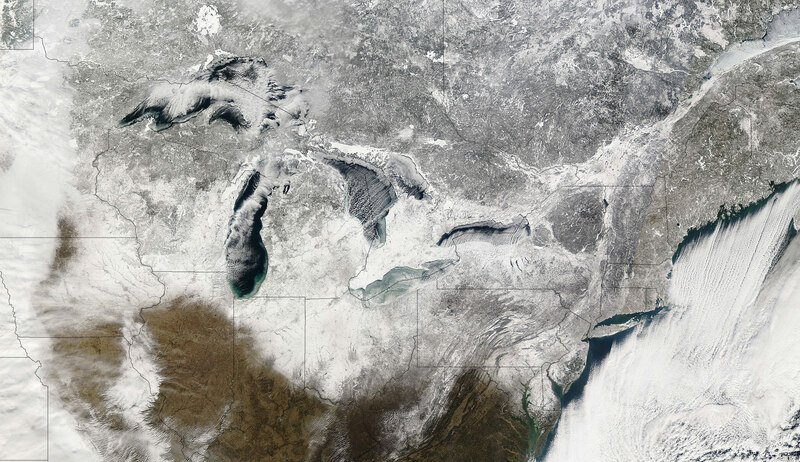 Using our modern designations of the Great Lakes, there is really no contest as to which would be the first to freeze. Erie is the smallest of the Great Lakes in terms of volume and roughly ties with Lake Ontario for smallest surface area. The small, shallow lake is therefore the first to freeze in the winter and the first to thaw in the spring. 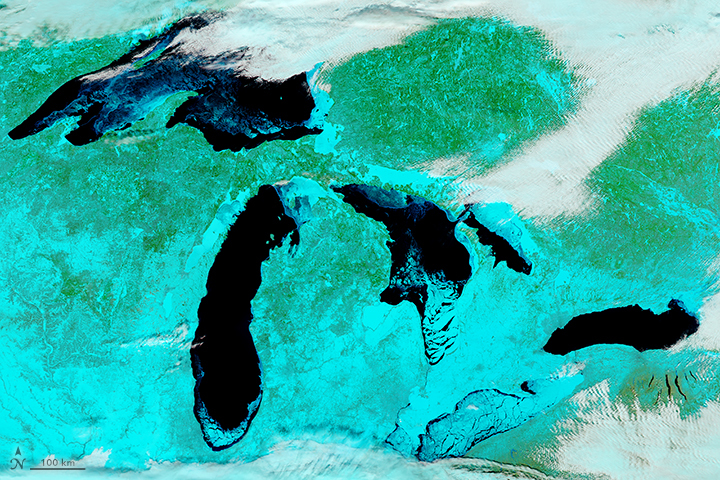 However, Georgian Bay, nearly cut off from Lake Huron by Manitoulin Island in the north and Bruce Peninsula in the south, was considered by the first European explorers as a lake in its own right; it is large enough to be in the world's top 20 largest lakes. If we used the historical descriptions of the Great Lakes, the race to be the first to freeze would be a much tighter contest. 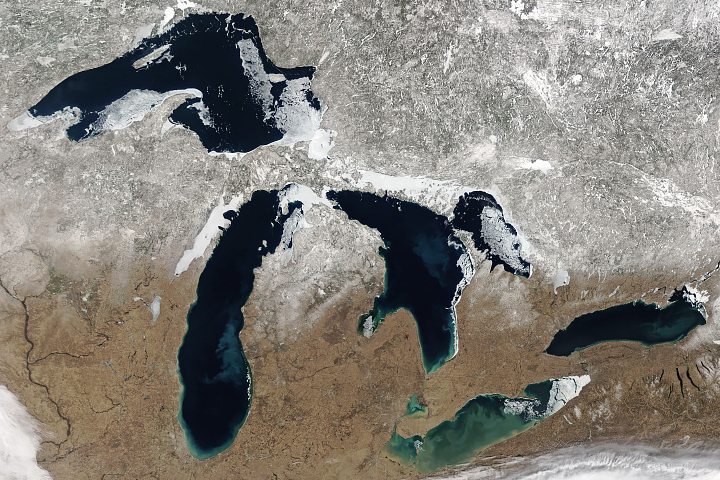 To keep track of winter's march across the Great Lakes, view daily imagery from the MODIS Rapid Response System at NASA's Goddard Space Flight Center. 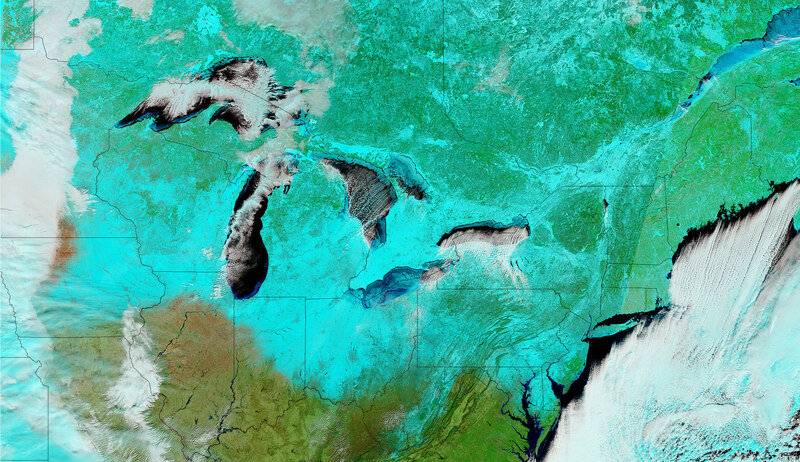 These images of the five Great Lakes show ice beginning to build up around the shores of each of the lakes, with snow on the ground across virtually the entire scene.